The Pastor and the Physicist continue to dialogue over matters of faith and science, prompted by feature articles in a pile of New Scientist magazines. Quantum physics has to make its appearance at some stage, and, sure enough the next lead story explores an experiment showing quantum particles that “lose their identity,” thus redefining reality. Out walking through King’s Park the other day, I found my path taking me through the backdrop of an amphitheatre where Alice in Wonderland was playing. I inadvertently became part of the scenery of the Mad Hatter’s Tea Party scene as I ambled by. 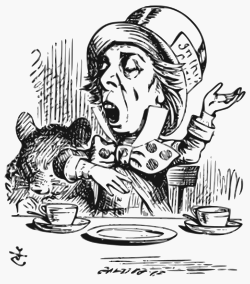 I can see the Mad Hatter, wielding a teapot holding a dozy dormouse, being quite at home in a discussion on quantum physics. The magazine piece itself, invites the Cheshire cat, grinning, and appearing and disappearing, purring with delight. How do we know what is real, and not just our own apprehension of reality? And, to what extent do we, as observers of reality, affect and transform the reality we believe we are perceiving? I do not ken the intricacies of quantum mechanics, but the discourse fascinates me. Is it because it often has to resort to the language of paradox and metaphor that is home territory for my own faith discipline? After all, how does one definitively discuss the mysteries of apocalyptic literature, the many-layered Johannine corpus and the power of parables? When it comes to groundedness in a universe of shifting perception, the Christian witness is of one reality to which faith points, the Alpha and Omega revealed in Revelation. And such a vision can contain the discoveries of the world of quantum physics. Thank you, TJ. We ought not be timid in engaging unknown territories for they prompt further exploration of the territory we thought we knew well! Thanks, Estelle. I noted your previous references to quantum physics as ‘the flavor of the month.’ It has popped up in conversations I’ve had with younger people for a few years now. New understandings of how the universe ticks appears to many to be more than mere words, indeed a reality with which to grapple. I see my task as their pastor to suggest linkages to the faith that is revealed. Strange and unfamiliar ideas are disconcerting. I assert depth of trust in the reality of relationship with Jesus Christ gives confidence and competence to tackle such conversations, God bless us all in our endeavours!